Recently Patient Claim Line were able to grant the wish of one young fan! We received an email from Saints fan Neil, asking whether he could buy a Patient Claim Line ‘Spinner’ for his son Harry.Harry has autism and has recently become a huge St Helens fan after one of their players, Tommy Makinson, visited his school. Since becoming a fan, Harry has really taken to the Patient Claim Line ‘spinner’ animation on the big screen before the TMO decision, and the video referee process as a whole. He saw our cardboard spinner on YouTube and has been nagging his dad to get him one so he can play along at home! It’s not every day you get this type of message, so we decided to hatch a plan! Between us, Sky, the RFL and Saints, we planned a big surprise for Harry and his family. 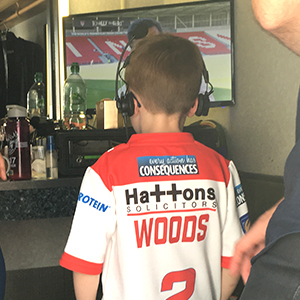 At the Saints vs Wakefield game, the family were met at the gates and started their experience with a full tour of the Sky broadcast trucks and met the Sky commentary team. Harry was then given special access into the official’s truck to meet the video ref and have a go at making the ‘Try/No Try’ decisions appear on the big screen, and learn how it all works. 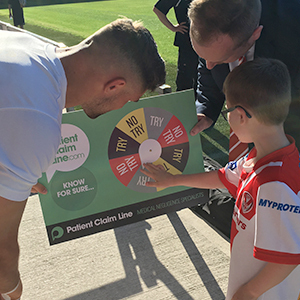 We then had Tommy Makinson meet the family pitchside and present Harry with his very own Patient Claim Line spinner to take home, before then heading up to a private box for match hospitality.